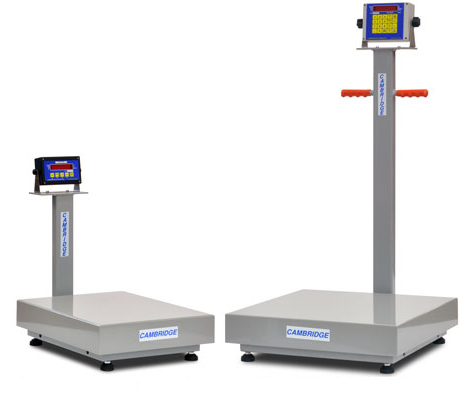 Cambridge Scale Works, Inc. Model 610 Series single point platform scales feature a cast aluminum structure, durable painted steel shroud, and environmentally sealed load cell for accuracy and durability. Cambridge Scale Works, Inc. Model 610-B Series single point platform scales feature a cast aluminum structure, durable painted steel shroud, and environmentally sealed load cell for accuracy and strength, plus a 20″ indicator column for easy eye level viewing. Cambridge Scale Works, Inc. Model SA 610 Series single point platform scales feature cast aluminum subframe, durable stainless steel shroud and environmentally sealed load cell for accuracy and dependability. Cambridge Scale Works, Inc. Model SA 610-B Series single point platform scales feature cast aluminum subframe, durable stainless steel shroud and environmentally sealed load cell for strength and accuracy plus a 20″ stainless steel indicator column for easy eye level viewing. Cambridge Scale Works, Inc. Model 640 Series single point platform scales feature tubular steel construction, heavy painted steel cover, and IP 65 water seal rated aluminum load cell for accuracy and reliability. Cambridge Scale Works, Inc. Model 640-B Series single point platform scales feature tubular steel construction, heavy painted steel cover, and IP 65 water seal rated aluminum load cell for accuracy and reliability. Model 640-B20 features a 20″ painted column with 4″ X 8″ indicator mounting plate. Model 640-B40 features a 40″ painted column with 4″ X 8″ indicator mounting plate. 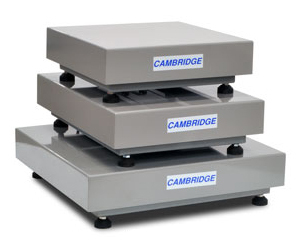 Cambridge Scale Works, Inc. Model SS640 Series single point platform scales feature tubular type 304 stainless steel construction, heavy gauge stainless steel cover, and environmentally sealed load cell for accuracy and reliability. Cambridge Scale Works, Inc. Model SS640-B Series single point platform scales feature tubular type 304 stainless steel construction, heavy gauge stainless steel cover, and environmentally sealed load cell for accuracy and reliability plus a 20″ indicator column for easy eye level viewing.